L-R: Rosie Wigfall, Ed Cross, Kimathi Donkor, Alistair Hicks, Cherie Federico. Photo: Charlotte Swinburn Photographer. 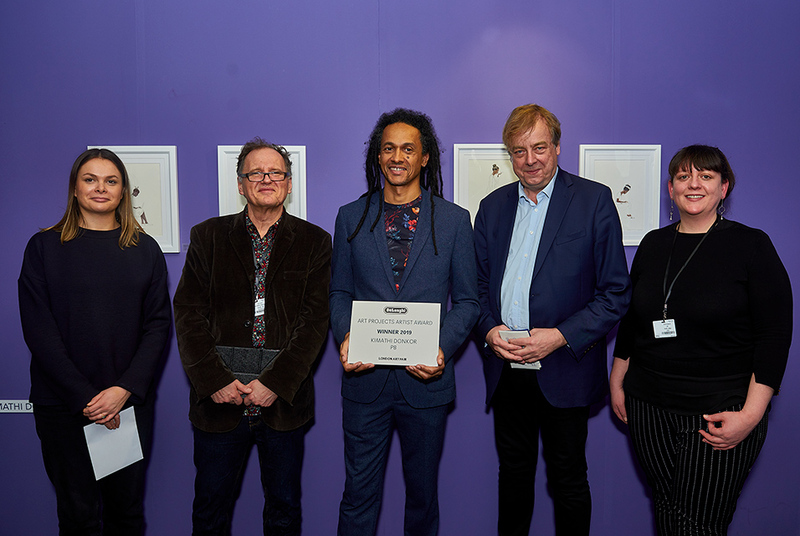 LONDON.- Last night (Tuesday 16 January), London Art Fair 2019 announced Kimathi Donkor, represented by Ed Cross Fine Art, as the winner of the DeLonghi Art Projects Artist Award 2019. Kimathi Donkors work is being exhibited as part of Art Projects, a curated sector of the Fair offering a platform for emerging galleries to showcase innovative contemporary art from across the world. Now in its 15th edition, the section brings together 33 galleries from 11 countries, showcasing some of the most stimulating contemporary art practice today. The winner was chosen by a judging panel carefully selected to include key art world figures from the areas of collecting, journalism, curating and education, comprising Jo Baring, Director of the Ingram Collection of Modern British and Contemporary Art; Alistair Hicks, writer and curator; Cherie Federico, director of Aesthetica; and Francesca Gavin, writer and curator. Kimathi Donkor is a contemporary artist who lives and works in London. His solo exhibitions include Some Clarity of Vision at Gallery MOMO (Johannesburg, 2015), Queens of the Undead at Iniva (London, 2012) and Fall/Uprising at the Bettie Morton Gallery (London, 2005). Group exhibitions include the Diaspora Pavilion (57th Venice Biennale, 2017), Untitled: Art on the Conditions of Our Time at the New Art Exchange (Nottingham, 2017) and the 29th São Paulo Biennial (Brazil, 2010). He has been the recipient of awards, residencies and commissions including the 2011 Derek Hill Painting Scholarship for The British School at Rome. Born in Bournemouth, Dr Donkor earned his PhD at Chelsea College of Arts in 2016 and is Acting Course Leader of MA Drawing at Wimbledon College of Arts. He also holds an MA degree from Camberwell College of Art and a BA (Hons) in Fine Art from Goldsmiths College. He is of Ghanaian, Anglo-Jewish and Jamaican family heritage, and as a child lived in rural Zambia and the English West Country. Kimathi Donkors work is in private and public collections internationally and in the UK, including The British Museum, The Wolverhampton Art Gallery, The International Slavery Museum, the Sindika Dokolo Foundation and The Robert Devereux Collection. Ed Cross Fine Art specializes in visual arts from the African continent and its diasporas as well as other artists with a significant connection with the continent. Artists include Kimathi Donkor, Wole Lagunju, Mario Macilau, Abe Odedina, Eric Pina, Charles Sekano and Richard Smith. Ed Cross has been heavily involved with the promotion of art from Africa and its diaspora over the last ten years. He established Ed Cross Fine Art in 2009 on his return from Kenya where he lived and worked for over 20 years.